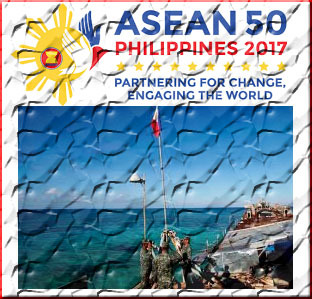 Home ASEAN Summit 2017 China Filipino Government International tribunal News Senators West Philippine Sea Some Senators suggested to use ASEAN chairmanship to rally over WEST PHILIPPINE SEA conflicts. Some Senators suggested to use ASEAN chairmanship to rally over WEST PHILIPPINE SEA conflicts. The government exists to protect and serve its people and their interest. Over a year ago, the international tribunal decided that China's nine-dash lines have no effect on the Philippines' exclusive economic zone, which is about 381,000 square kilometers of maritime space. That's bigger than the Philippine land area of 300,000 square kilometers. And that maritime space includes fish and other marine life, as well as oil, gas, and mineral resources. Since before the decision, China has been taking our food. It's been taking our fish. The government, in behalf of the Filipino people, and especially our fisher folk, should enforce this decision so that our fisher folk can go back to this maritime space and fish. We suggest that the government use its ASEAN chairmanship to rally our allies and friends to this end -- for our people, for our fisher folk.